A powerful earthquake toppled buildings, schools and chemical plants Monday in central China, killing about 10,000 people and trapping untold numbers in mounds of concrete, steel and earth in the country's worst quake in three decades. The 7.9-magnitude quake devastated a region of small cities and towns set amid steep hills north of Sichuan's provincial capital of Chengdu. Striking in midafternoon, it emptied office buildings across the country in Beijing and could be felt as far away as Vietnam. As Tuesday dawned, rescuers were frantically searching for more survivors, but rain was compounding the difficulty. Premier Wen Jiabao, who flew to the region, said rain was forecast for the next several days. The government was pouring in troops to aid in the disaster recovery. Xinhua said 16,000 were in the area and 34,000 more were en route. Snippets from state media and photos posted on the Internet underscored the immense scale of the devastation. In the town of Juyuan, south of the epicenter, a three-story high school collapsed, burying as many as 900 students and killing at least 50, the official Xinhua news agency said. Photos showed people using cranes, mechanical hoists and their hands to remove slabs of concrete and steel. The news agency reported on Tuesday that another 1,000 students and teachers were buried and feared dead when a high school collapsed in Beichuan county. The building was reduced to a pile of rubble two yards high, it said. Buried teenagers struggled to break free from the rubble in Juyuan, "while others were crying out for help," Xinhua said. Families waited in the rain near the wreckage as rescuers wrote the names of the dead on a blackboard, Xinhua said. Parents of the dead students built makeshift religious altars at the site, resting the corpses on any available piece of plywood or cardboard, and burning paper money and incense in a traditional honor for their child in the afterlife, according to NPR's Melissa Block. The earthquake hit one of the last homes of the giant panda at the Wolong Nature Reserve and panda breeding center, in Wenchuan county, which remained out of contact, Xinhua said. But the agency reported that 60 pandas at another breeding center in Chengdu were safe. In Chengdu, it crashed telephone networks and hours later left parts of the city of 10 million in darkness. "We can't get to sleep. We're afraid of the earthquake. We're afraid of all the shaking," said 52-year-old factory worker Huang Ju, who took her ailing, elderly mother out of the Jinjiang District People's Hospital. Outside, Huang sat in a wheelchair wrapped in blankets while her mother, who was ill, slept in a hospital bed next to her. The overall death toll increased to about 10,000, the official Xinhua News Agency reported Tuesday. It said nearly 10,000 people died in central China's Sichuan province alone and 300 others in three other provinces and the mega-city of Chongqing. Worst affected were four counties including the quake's epicenter in Wenchuan, 60 miles northwest of Chengdu. Landslides left roads impassable Tuesday, causing the government to order soldiers into the area on foot, state television said, and heavy rain prevented four military helicopters from landing. Wenchuan's Communist Party secretary appealed for air drops of tents, food and medicine. "We also need medical workers to save the injured people here," Xinhua quoted Wang Bin as telling other officials who reached him by phone. To the east, in Beichuan county, 80 percent of the buildings fell, and 10,000 people were injured, aside from 3,000 to 5,000 dead, Xinhua said. State media said two chemical plants in an industrial zone of the city of Shifang collapsed, spilling more than 80 tons of toxic liquid ammonia. 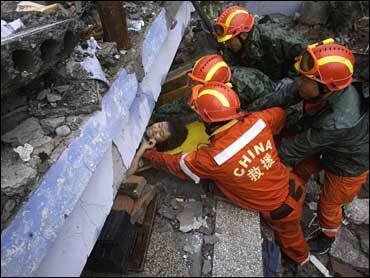 The news agency said about 600 people died in Shifang and up to 2,300 were buried by rubble. Though slow to release information at first, the government and its state media ramped up quickly. Wen, a geologist by training, held an early morning emergency meeting near Chengdu and ordered troops and police to clear the road north to Wenchuan. "We must try our best to open up roads to the epicenter and rescue people trapped in disaster-hit areas," he said. Wen said the earthquake "was more serious" than expected. Television footage showed large boulders and downed trees blocking the road to Wenchuan. Disasters always pose a test for the communist government, whose mandate rests heavily on maintaining order, delivering economic growth, and providing relief in emergencies. Pressure for a rapid response was particularly intense this year, with the government already grappling with public discontent over high inflation and a widespread uprising among Tibetans in western China while trying to prepare for the Aug. 8-24 Beijing Olympics. "I am particularly saddened by the number of students and children affected by this tragedy," President Bush said in a statement. U.S. State Department spokesman Sean McCormack said no aid requests had been made by China. International Olympic Committee President Jacques Rogge sent his condolences to President Hu Jintao, adding: "The Olympic Movement is at your side, especially during these difficult moments. Our thoughts are with you." The quake was the deadliest since one in 1976 in the city of Tangshan near Beijing that killed 240,000 - although some reports say as many as 655,000 perished - the most devastating in modern history. A 1933 quake near where Monday's struck killed at least 9,000, according to geologists. Monday's quake occurred on a fault where South Asia pushes against the Eurasian land mass, smashing the Sichuan plain into mountains leading to the Tibetan highlands - near communities that held sometimes violent protests of Chinese rule in mid-March. Much of the area has been closed to foreign media and travelers since then, compounding the difficulties of getting information. Roads north from Chengdu to the disaster area were sealed off early Tuesday to all but emergency convoys. In Chengdu, the region's commercial center, the airport closed for seven hours, reopening only for emergency and a few outbound flights. A major railway line to the northeast was ruptured, stranding about 10,000 passengers, Xinhua said. Although most of the power had been restored by nightfall, phone and Internet service was spotty and some neighborhoods remained without power and water. Nervous residents spent the night outside, some playing cards or heading to the suburbs. State media, citing the Sichuan seismology bureau, reported 313 aftershocks. "Traffic jams, no running water, power outs, everyone sitting in the streets, patients evacuated from hospitals sitting outside and waiting," said Ronen Medzini, an Israeli student in Chengdu, via text message. When it hit shortly before 2:30 p.m., the quake rumbled for nearly three minutes, witnesses said, driving people into the streets in panic. "It was really scary to be on the 26th floor in something like that," said Tom Weller, a 49-year-old American oil and gas consultant staying at the Holiday Inn. "You had to hold on to something like that or you'd fall over. It shook for so long and so violently, you wondered how long the building would be able to stand this." While most buildings in the city held up, those in the countryside tumbled. On the outskirts of Chongqing, a school collapsed, killing at least five people. Residents said teachers kept the children inside, thinking it was safer. The city of Mianyang ordered all able-bodied males under 50 to take water and tools and walk or drive to Beichuan, where most of the buildings had collapsed. State TV broadcast tips for anyone trapped in the earthquake. "If you're buried, keep calm and conserve your energy. Seek water and food, and wait patiently for rescue," CCTV said. China's two stock exchanges suspended trading Tuesday in 66 companies based in the region in an effort to minimize potential disruptions from the disaster. In Tokyo, Toyota Motor Corp. spokesman Toshiaki Hori said production had been suspended at the company's Chengdu factory. Although initially measured at 7.8 magnitude, the U.S. Geological Survey later revised its assessment of the quake to 7.9. Its depth - about six miles below the surface, according to the USGS - gave the tremor such wide impact, geologists said. The earthquake also rattled buildings in Beijing, 930 miles to the north, causing evacuations of office towers. People ran screaming into the streets in other cities, where many residents said they had never felt an earthquake. When word spread that the quake was centered in Sichuan, some people in Beijing fought to fly there despite cancelled flights to Sichuan's capital, CBS News' Celia Hatton reports. In Beijing, where hundreds of thousands of foreign visitors are expected for the Olympics, stadiums, arenas and other venues for the games were undamaged. Li Jiulin, a top engineer on the 91,000-seat National Stadium - known as the Bird's Nest and the jewel of the Olympics - was conducting a site inspection when the quake struck. He told reporters the building was designed to withstand a 8.0 quake. "The Olympic venues were not affected by the earthquake," said Sun Weide, a spokesman for the Beijing organizing committee. "We considered earthquakes when building those venues." Some 660 miles to the east in Anhui province, chandeliers swayed in the lobby of the Buckingham Palace Hotel. "We've never felt anything like this our whole lives," said a hotel employee surnamed Zhu. The massive Three Gorges dam, the world's largest about 350 miles to the east of the epicenter, was not affected, according to the information office of State Council Three Gorges Construction Committee. The area around the enormous dam remains increasingly precarious as rising waters in the reservoir have led to landslides.